Seduction in Black is a daring interpretation of the Blue Seduction fragrance, taking its seductive facet to the next level. It emphasizes woody, ambary [sic] and oriental accords, enhanced by an original and interesting spicy note that embodies the fragrance's freshness and sensuality. Never smelled any of his offerings so can’t comment on them – but am I the only one who thinks his face looks weird? It’s as if someone put an invisible thread through the corner of his mouth then yanked it up to his ear. I suppose he’s meant to look – uh – seductive; but he just looks uncomfortable to me. I spent a long time looking at it this morning…it’s a very odd shot. It looks like a Botox grin. Oh, that could be it. Maybe he and Melanie Griffith are sharing a plastic surgeon now. Agreeing with all of you. I am not feeling seduced! I totally agree. His facial expression just looks odd. Reminds me of the Latisse ad in my Allure mag – Brooke Shields has the same weird grin. Maybe it’s a new celebrity fad. Fragrance sounds worth a try, although even if I thought DH would like it, he probably wouldn’t wear it. Not too into the celebriscents. At the very least he looks simpering not seducing. But the more I look at the more it seems like he is being inflicted with bodily harm by someone who smells very bad. He does look like he’s been pulled a bit tight. And then paralyzed with Botox. I kind of like the retro-ish typeface and simple bottle. But I have already forgotten about it…. The bottle is fine. I’ve never smelled any of the scents though. They’ve all been pretty underwhelming. Nothing special. Not horrible, just forgettable. It strikes me that Tony needs to use a different front man if he wants to continue in the celebrity perfume biz. He seems less than seductive; more like a middle aged guy stumbling through an identity crisis. I’m sure he’s a perfectly nice man, but … I think he’s gotten some bad advice. Might be good advice though: I think his fragrances do quite well. Where did his lips go? 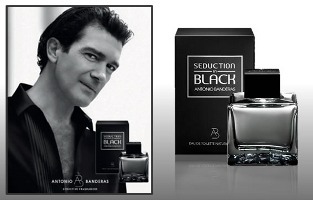 This doesn’t even look like Banderas. I’ll forever think of him as he appeared in the 1980s films of Pedro Almodóvar. Oh yessssss, if only he had stayed in Spain, remained in his 20s and NEVER met Melanie Griffiths… If only…. Good point. This one is better named. Yeah. It’ll sell in any case.